I've just set up the dates for all the July 2008 Free Storytelling Teleconferences. Go to http://www.storytellerconference.com/ to register and learn more. "Will Your Clients Call You First? 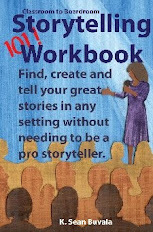 Ten Easy Ways to Stay In Their MindTops"
"So You Want To Be a Professional Storyteller?" "Storytelling 101: An Introduction to Storytelling for All Types of Storytellers." "Public Speaking 911: Five Fixes for Public Speaking Problems." "Making Your Storytelling CD (Right the First Time.)" "Will Your Clients Call You First? Ten Easy Ways to Stay In Their MindTops." I was in a city across the country from me and I was teaching the corporate storytelling version of my “Storytelling 101" presentation for a large company. The training had been designated as a “not mandatory but we want you to be there” event, so some people came to the meeting just a bit hostile. During the break, I was, umm, sitting in the bathroom and behind a closed door. That’s all I will say about that. Just know that those who came in could not see me. Two other men entered the bathroom and as they washed their hands, they began to talk about how “stupid” it was for them to be there at storytelling training. “What do I need corporate storytelling for?” the first man asked the other and continued with other gripes. He then went on to explain that he directed the process where the company secured new buildings. He told me about how they have to help the decision makers understand how the building will be used, not just how much it costs. He then told me about one particular building they acquired that was now used to help families work through long-term illness saying, “What a difference it makes in the lives of people.” The pride of his work was clearly reflected in his conversation. He stopped, took a long look into the mirror and sighed. He knew I had caught him in the proof that every area of every business uses storytelling. He knew that he had just used storytelling to tell me about his work. This executive looked right at me, mumbled, “Oh, (censored)” and walked out the door. My new corporate friend was very attentive the rest of the training session. No matter what your company is about, I would be honored to train you and your staff in the power of corporate storytelling. Please let me know how I can help you. Greetings. I am doing a "soft release" of the Outside In Storytelling Marketing Boot Camp Audio Training Kit. The kit will include 4-5 CD's of audio training, most of which was recorded live at the OISB Camp. Your kit will also have the handouts and worksheets as well as a certificate good for a 1/2 hour phone coaching meeting with me. All of this will be in a three ring binder. I am releasing the kit on or about July 15, 2008. We don't have the final cost yet, but it will be no less than $295. HOWEVER, you, beloved readers, can order the kit NOW in pre-release status for just $189 plus the $4.95 shipping. I am only selling 10 of these at this price. First come, first serve. You'll get your kit in July when it is released. Remember, this is the kit only, not a camp registration. Order now. My phone coaching costs more than $189 for an hour, so this WHOLE KIT for $189 is a steal. The amount of information in this kit will change your career, if you are really serious about your performing artist business. You can order at our online store at this link here. It's minimal info right now, but the store is open. Of course, the camp in August is STILL ON and we would love to host you in August. You get the audio files as part of the camp registration, by the way.